"What are democracies meant to do? And how does one know when one is a democratic state?" These incisive questions and more by leading political scientist, Steven Friedman, underlie this robust enquiry into what democracy means for South Africa post 1994. Democracy and its prospects are often viewed through a lens which reflects the dominant Western understanding. New democracies are compared to idealised notions of the way in which the system is said to operate in the global North. The democracies of Western Europe and North America are understood to be the finished product and all others are assessed by how far they have progressed towards approximating this model. The goal of new democracies, like South Africa and other developing nation-states, is thus to become like the global North. 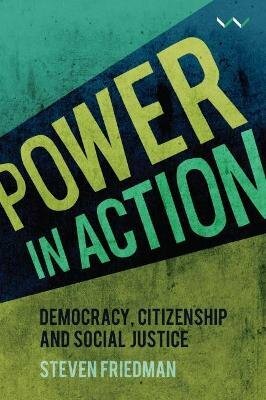 Power in Action persuasively argues against this stereotype. Friedman asserts that democracies can only work when every adult has an equal say in the public decisions that affect them. From this point of view, democracies are not finished products and some nations in the global South may be more democratic than their Northern counterparts. Democracy is achieved not by adopting idealised models derived from other societies – rather, it is the product of collective action by citizens who claim the right to be heard not only through public protest action, but also through the conscious exercise of influence on public and private power holders. Viewing democracy in this way challenges us to develop a deeper understanding of democracy’s challenges and in so doing to ensure that more citizens can claim a say over more decisions in society.